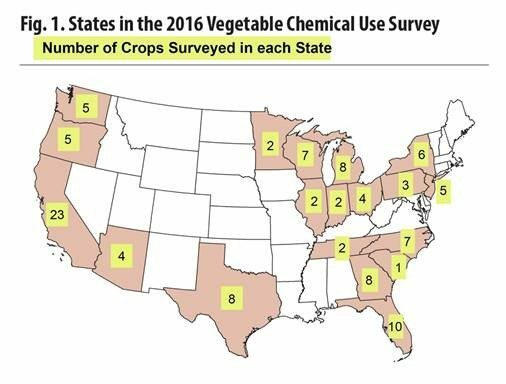 The 2016 Agricultural Chemical Use Survey collected data about pesticide use and pest management practices on acres planted to 28 different vegetable crops. NASS conducted the survey among producers in 19 states, focusing on the states that were major producers of the surveyed crops. (Fig. 1) In California, NASS collected data for 23 crops, the most number of crops selected for any of the states surveyed. In most cases, the combination of states surveyed represented a significant percentage of the acres planted in 2015. Data are for the 2016 crop year, the one-year period beginning after the 2015 harvest and ending after the 2016 harvest. Data are available online for all 28 vegetables through the Quick Stats 2.0 database at http://quickstats.nass.usda.gov. The pesticide active ingredients used on vegetables are classified as herbicides (targeting weeds), insecticides (targeting insects), fungicides (targeting fungal disease), and other chemicals (targeting all other pests and other materials, including extraneous crop foliage). Bell pepper growers applied fungicides to more acres (84 percent of planted acres) than insecticides or herbicides (81 and 44 percent of planted acres, respectively). Watermelon and squash growers similarly applied fungicides to more acres than other pesticides. Pumpkin growers, on the other hand, applied herbicides to 76 percent of planted acres, but fungicides and insecticides to fewer acres. Onion growers applied the various kinds of pesticides more equally. The survey asked growers to report on the practices they used to manage pests, including weeds, insects, and diseases. Vegetable growers reported practices in four categories of pest management strategy, widely referred to as PAMS – prevention, avoidance, monitoring, and suppression. Avoidance practices use cultural measures to mitigate or eliminate the detrimental effects of pests. Monitoring practices observe or detect pests by sampling, counting, or other forms of scouting. Suppression practices involve controlling or reducing existing pest populations to mitigate crop damage. Scouting for insects, mites, and diseases were the most widely reported monitoring practices, used on 99 percent of vegetable planted acres. The most widely used avoidance practice was crop rotation, used on 82 percent of planted acres. The prevention practice of chopping, spraying, mowing, plowing, or burning field edges, ditches, and fence lines was used on 78 percent of planted acres, and the suppression practice of applying various pesticides to keep pests from becoming resistant was used on 73 percent of acres. The Agricultural Chemical Use Program of USDA’s National Agricultural Statistics Service (NASS) is the federal government’s official source of statistics about on-farm and post-harvest commercial fertilizer and pesticide use and pest management practices. NASS conducts agricultural chemical use surveys as part of the Agricultural Resource Management Survey. NASS collected data on vegetable chemical use in fall 2016. For more information and access to the survey dataset, click here.